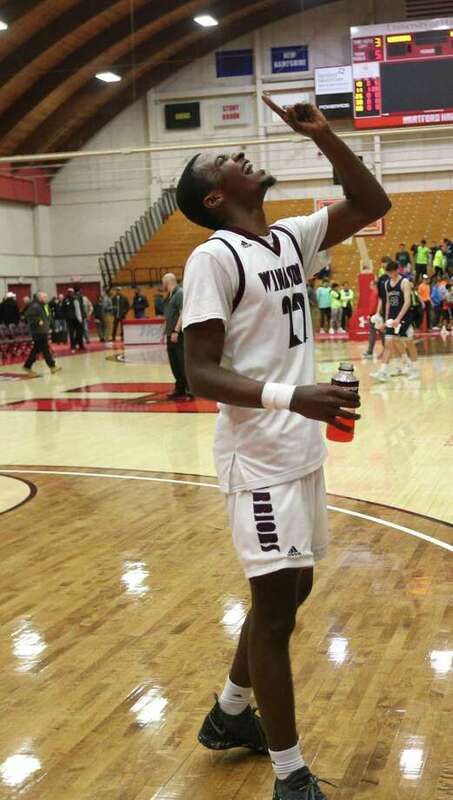 Windsor High School’s Alexander Peterson celebrates the team win over Immaculate High School in the CIAC Division I boys varsity basketball semifinal game at the University of Hartford on Wednesday, March 13, 2019. Amir Spears wasn’t going to have it any other way. Carrying the team on his back at crucial stages, Spears scored 28 points — many of which were of high difficulty — and the No. 6 Warriors sealed a first state championship berth since 2014 with a 71-62 win over No. 7 Immaculate in the Division I semifinal at the Chase Family Arena. The Warriors dropped a heartbreaking 59-58 decision to Sacred Heart in the same building a year ago at this stage after blowing a large lead, but this time they saw the win out with a dominant final frame. The win sets up a titanic clash with CCC rival East Catholic on Saturday night at 8:15 at the Sun. Knowing playing catchup against the patient Mustangs down the stretch would be a challenge, Windsor sprung to life in the fourth quarter with the game on the line. With the game deadlocked at 46-46 with seven minutes left, the pace quickened in favor of the quasi-hosts as several key turnovers sparked momentum. The game was tight throughout as the two teams traded buckets through three quarters and into the fourth. Immaculate led by as many as seven points early on but the explosiveness of the Warriors was always lurking. Turnovers were the biggest Achilles’ heel for the Mustangs. The loss capped a 21-5 season for Immaculate, which got 19 points from Quinn Guth. Mike Basile and Jack Woods (10 each) played their final game for the Mustangs, who won the Division II title last year. Amir Spears, Windsor: The junior added several key steals to his final stat sheet, including a trio in the backcourt that led to easy points for the Warriors. Quinn Guth 8 0-0 19 Sean Guiry 5 2-5 12 Joey Rios 5 0-0 11 Jack Woods 4 0-0 10 Mike Basile 5 0-0 10. Totals: 27 2-5 62. Amir Spears 11 6-6 28 Corey McKeithan 3 3-4 11 Alexander Peterson 3 2-2 10 Jordan Riley 3 2-4 8 Lawrence Foreman 3 1-2 7 Shomar Leaphart 3 0-1 7. Totals: 26 14-19 71. 3-pointers: I—Guth 3, Rios, Woods 2; W–McKiethan 2, Peterson 2, Spears 2, Leaphart.